This week’s Loose Change comes from Eileen Adamson, a financial coach who blogs at Your Money, Sorted about making good financial decisions and having more money to spend on the things you love. I am now the proud, and slightly frazzled, mum of a 17 year old learner driver. Our elder daughter turned 17 a couple of weeks ago and we have been out driving each night, which I admit, has been scarier than I thought it would be! The only thing that has been scarier is the price of insuring teenagers to drive a car. I remember when I bought my first car 25 years ago, I was horrified to pay £515 for my insurance. If we consider the impact that inflation has had over the years, then the equivalent price today would be around £780. It turns out that the price of insurance has shot up over the past 25 years. Try doubling, trebling or even quadrupling that figure and it will give you an idea of how much it can cost to insure teenagers for a car. The idea of being able to insure a teenager for his/her own car for around £780 is laughable. It’s really not funny, because the price of insurance must be a barrier to many young people learning to drive well. Many families will only be able to afford to pay for driving lessons, and not be able to insure them for the family car, so that they can practice in between their lessons. This is a bad thing for our drivers of the future. Learning to pass a test is one thing; learning to be a good driver is another. If our teenagers do not get the opportunity to practise their driving while they are accompanied by another adult, then it will take them much longer to become experienced and competent drivers. This will result in more crashes, pushing up the cost of insurance further, and making learning to drive in the future even more inaccessible for many teens. We only have one car, and have no desire for another, so our daughter needed to learn in our car. Turns out that a 10 year old Citroen Grand Picasso is not the car of a teenage girl’s dreams! However, when faced with the choice of it or nothing, she decided that it would “have to do!”. All I needed to do now was sort out the insurance for it. I knew that learner’s insurance was a lot cheaper than insuring them after they have passed their test, so I was hopeful that I could get a good deal. My first port of call was our current insurance provider, only to find that the premium would be nearly 3 times, what it currently was. At just over £750, that simply wasn’t an option. I then trawled the net to find the best ways of reducing the premium for adding my daughter to our insurance. It turns out that there a lot of different things that can bring the price down. Use at least 4 different comparison sites, such as Confused.com, Compare The Market, Go Compare and Moneysupermarket. Try putting the excess up and down, just to see the difference it makes to the quote. You may find that having a higher excess can bring down the cost of the policy. Consider insuring the excess separately if you find that a high excess reduces the cost of the policy. Adjusting your job title can reduce your premium, although make sure that you don’t lie on your application, as this could affect any payout. 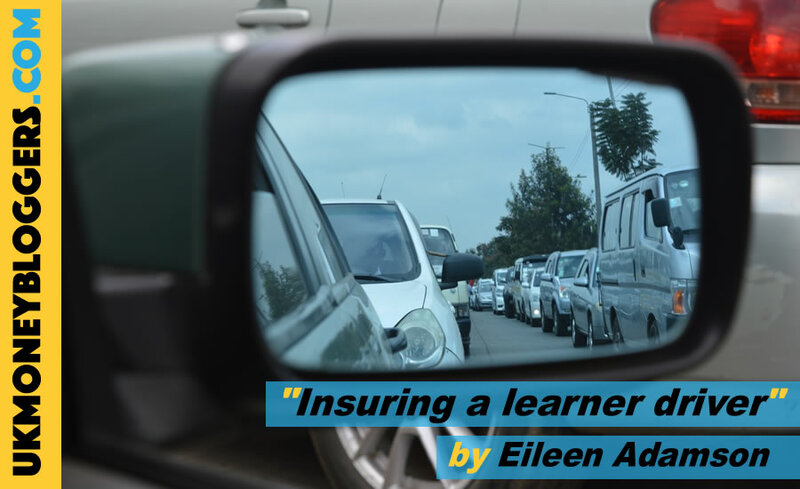 Consider specific learner driver insurance, which can be used as an addition to your current insurance policy. This means that the learner driver is insured separately, and any claim will not impact on your own no claims bonus. Again, compare prices on this insurance, before choosing a policy. It can take a wee while to go through this process, but it is certainly worth taking the time to do. I got my original £750 down to £303, which is a pretty good return for a couple of hours work. One thing that is really important in getting a cheaper quote is your timing. You will get the cheapest price for insurance by comparing quotes 4-6 weeks before the premium is needed. The closer the renewal date, the higher the quote. I made sure that I compared prices around 5 weeks before we needed the insurance. Confused.com came up with the best quote, so I happily saved that quote, which said “price expires 27th March” and made a note in my diary to come back to it nearer her birthday to pay for it. On the 24th March I decided to log into my account, accept the quote and sort the insurance. I clicked the link and got transferred to the GoGirl website, where I had to pop in another couple of details and proceed to payment. However the price quoted was now over £120 more expensive than it was! I phoned GoGirl to query this, but was told that “the prices on our website change daily. That is stated on our website”. I explained that on Confused.com it had said that “price expires on 27th March”, but the girl I spoke to merely repeated what she had already said about their prices changing daily. She said that there was nothing that could be done about it, and that was the price I had to pay. I am well aware that prices increase, the closer it is to the renewal date, which is why I had compared them well in advance. It seemed to me highly unfair though, that Confused.com should state “price expires 27th March”, yet when I went to get my quote on 24th March, the price had increased. After contacting both Confused.com and GoGirl to complain about this, I discovered the reason for the increase. When I had done my original comparison, I had forgotten to add business use to the quote. By changing details, I was creating a new quote. Therefore my quote was based on the fact that it was only a few days until the policy would be active. Obviously the price is then more expensive. Sadly, the only person I have to blame is me! Lesson learned. When comparing insurance, ensure that you have all the correct details initially, because changing anything at a later date can turn into an expensive mistake. Despite having to pay extra because of my mistake, I am really glad that we have got her insured for our car. Even in a couple of weeks, I can see that she is making good progress. Hopefully by the time she passes her test, I will be confident that she is a “good” driver. Then I will need to start comparing insurance policies all over again. This time I will be checking and double checking the information when getting quotes! Our oldest is turning 17 in a few weeks and keen to get driving. I can get him added to my car insurance for around £40 a month (although I’ll certainly shop around in the way you suggest). But I’m looking ahead to getting him insured to drive on a full licence and hearing horror stories about the cost. I’ve seen it can be around £2.5k for the year, which is just unaffordable (especially as his sister is only 20 months younger). It makes me wonder what the point of getting them to take the test is. They might as well stay on provisional licences until they’re 25! did your daughter take the test yet and have you had to wrestle with the cost of insuring on a full licence yet?